A tremendously destructive derecho raced from northern Illinois all the way to the east coast yesterday afternoon and evening. This windstorm left thousands without power and produced numerous surface wind gusts that far exceeded synoptic scale winds aloft at any level. 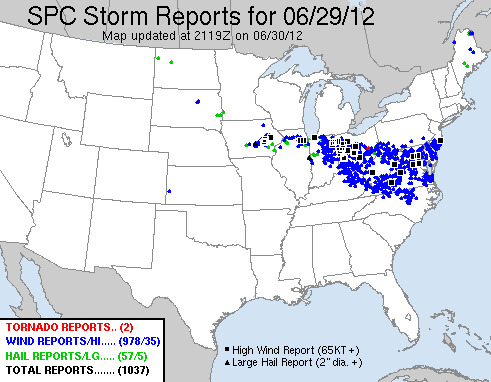 The graphic above shows the severe storm reports from SPC - note that over a thousand severe reports were logged. It is interesting to note the lack of reports from West Virginia - apparently this reflects problems with the reporting network and not a real lack of strong winds there. 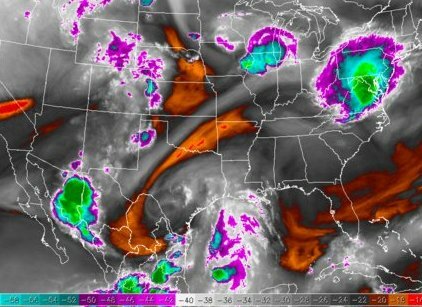 Above is a water vapor image from 8 pm MST (11 pm EDT) yesterday. The large derecho system was approaching the east coast, with a smaller trailing system over northern Illinois. A similar appearing, large MCS was also occurring over northern Sonora. The 00 UTC evening sounding from Sterling, Virginia, (below) taken ahead of the derecho, exhibits tremendous CAPE values and a nearly linear hodograph - both characteristic of environments that produce derechoes. Jack Hales captured a nice loop of Wednesday afternoon's storms (27 June 2012) - the view is looking north from Kitt Peak. 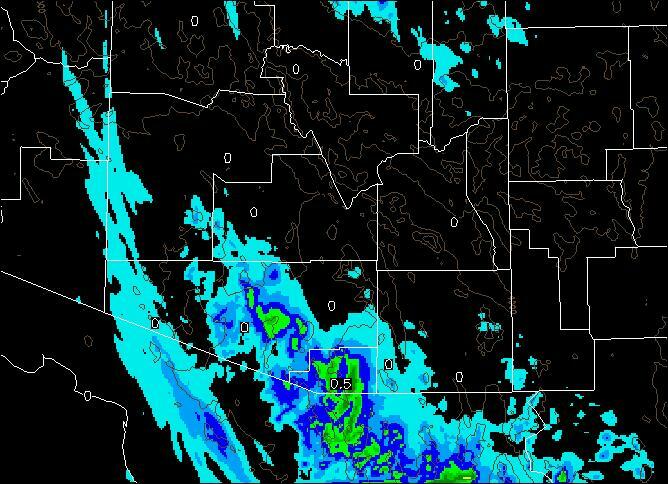 Radar composite from NCAR RAL above is from 6 pm MST. There was a very large MCS with cold cloud-tops over northern Mexico last evening (04 UTC image on 30 June above from NCAR RAL). This system sent outflows into southeastern Arizona during the night and kicked the PW back up a bit, although the main push of this system was to the west. 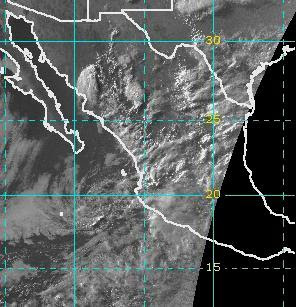 Lots of debris cloud this morning (1345 UTC visible image from CoD weather below) northern Mexico, southern 2/3rds of New Mexico, and southeastern Arizona. 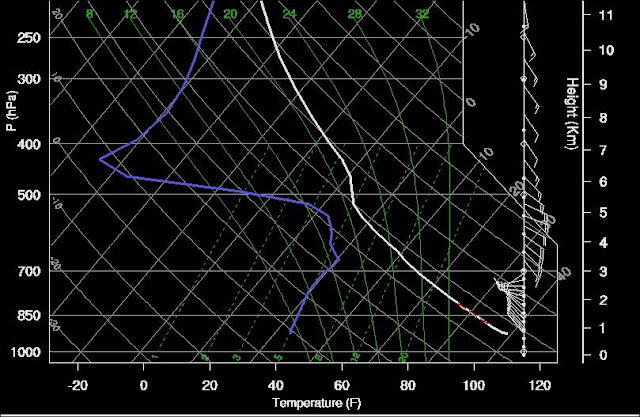 This morning's TWC sounding (above from SPC) indicates only a sliver of afternoon CAPE at low elevations. 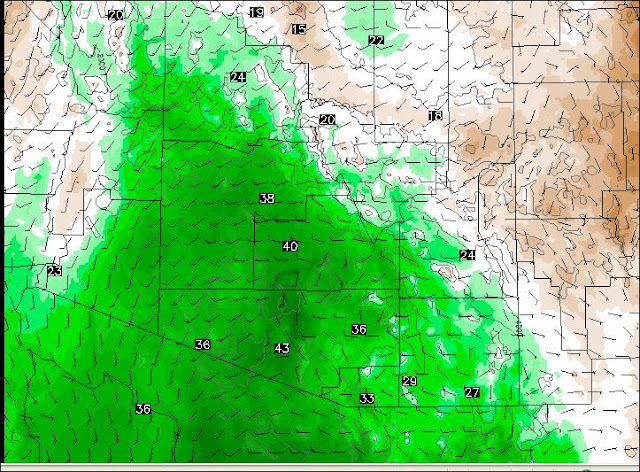 Tricky situation with very dry low-level air to the northwest of Tucson and moist air to southwest. 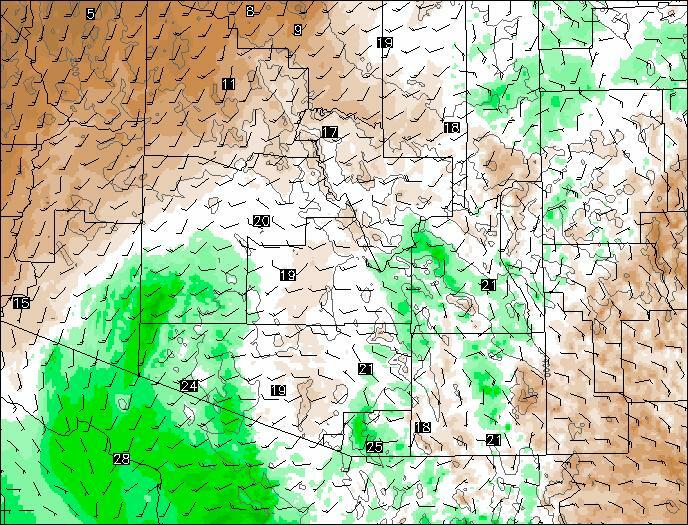 Advective flow below 500 mb appears to be from northwest in the NAM forecasts (WRF-GFS not available), which would keep storms south and east of metro Tucson again today. The vertical wind profile is totally chopped up, and with light wind speeds (both above and hodograph below). The middle to upper-level anticyclone is nearly vertical and nearly overhead - not a good situation. I have to say that this week's patterns remind me very much of last summer. Also, not good. We have been away from Tucson this week and have just returned late this afternoon. The rain gauge is dry here, although there were storms around the area (especially south to west to north) on Tuesday and Wednesday. It looks like we had some wind and dust here at the house but rain gauge is bone dry. The airport had 0.05" and thunder on Tuesday and thunder, wind and dust with gusts to 54 mph on Wednesday. I see that PW has been holding around 30 to 35 mm during the week (see above), which is marginal for summer storms. The TWC soundings seem to have returned to their typical pattern of being mostly too dry, especially for the 00 UTC soundings. I see that best PW values remain in Mexico, near and south of 30 degrees N. There may be hope for a better storm environment in a couple of days. Good to be home and will catch up on things over the weekend. Storms evolved basically similar to the WRF-GFS forecast yesterday afternoon. 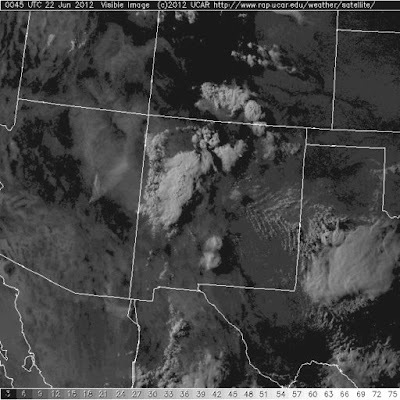 Above is a shot of the anvil from a storm near Picture Rocks at about 4 pm MST and below is 3 PM NWS radar composite. The storm to the west produced a couple of rumbles of thunder here a, the anvil thickened some overhead. Radar shows that an area of storms formed to the west and these produced an outflow (passed here at 3:50 pm MST) from the west that was gusty and dusty, but not nearly as strong as the model had forecast. 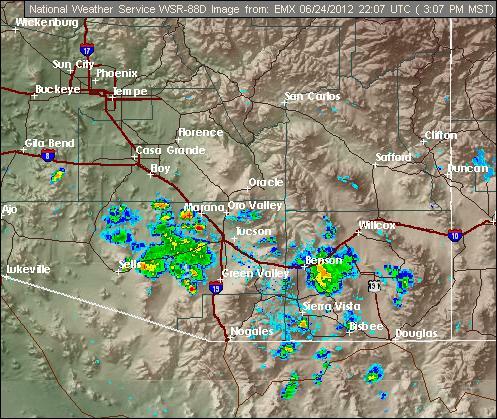 Generally the storms were weaker than forecast by the model, and there was more activity to the east of Tucson. Only 8 of the 93 Pima County ALERT gauges had rainfall, with the only significant amount falling at Picture Rocks - from the storm whose anvil is shown above - 0.59 inches. This morning's TWC sounding is similar to yesterday's with the SPC analysis indicating a sliver of CAPE. However, comparison with the GPS data indicates that the sounding was 2/10" too dry, so there may be better CAPE around this afternoon. The wind profile remains a bit chopped up, with no good steering flow. So, another afternoon of mountain-initiated storms drifting toward wherever the CAPE is best. The axis of high precipitable water remains out to the west of Tucson - so activity may be heaviest from south to west, as per yesterday. No WRF-GFS output available this morning. Final note - the NHC forecasts switched to the eastern path yesterday. However, global models still break off an inverted trough from the large circulation over the GoM that they forecast to move westward. The early WRF-GFS forecast from Atmo this morning (Sunday, June 24th) is interesting because of the features that evolve over central and eastern Pima County this afternoon. The thing to watch will be whether or not the model has forecast the mesoscale details correct. The morning TWC sounding (above from SPC) was truncated at about 250 mb. But of note are the light and variable winds below 500 mb; however, the temperature at 500 mb is a cool -8C (but with warm advection possible during the day). My eyeball says that there is a small amount of CAPE possible at low elevations this afternoon - the WRF-GFS also forecasts some CAPE at TUS at 1 pm MST this afternoon. However, better CAPE is forecast over Santa Cruz County northwestward across central Pima County. 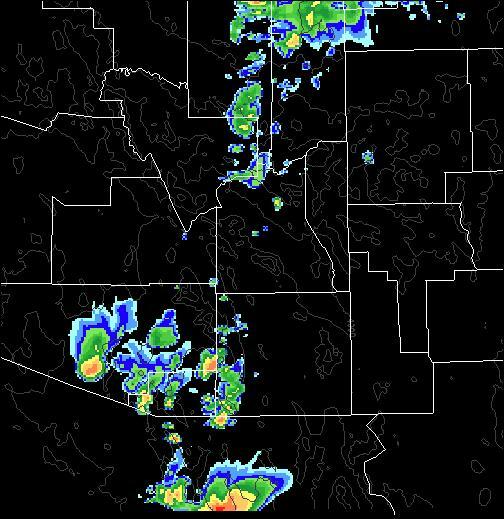 By 2 pm MST the model forecasts strong thunderstorms in central Pima County (composite radar product below). These storms produce a strong outflow (3 pm MST, 10 m winds below) that moves across the Tucson metro area from west to east during the mid-afternoon. We observe similar situations several times each summer, and I will be interested to see if the model forecast has these spatial details correct. 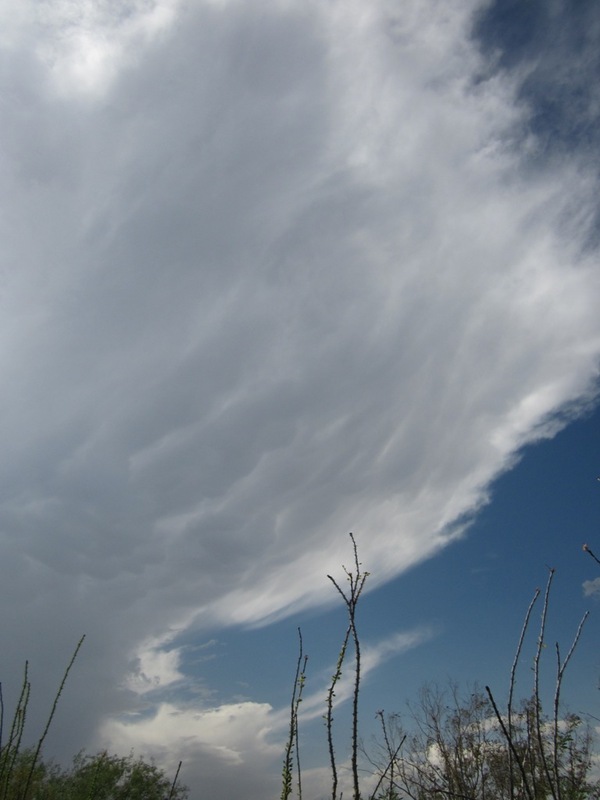 Although a second area of storms develops later in the afternoon over Santa Cruz County, the Tucson area is stabilized by the outflow, with only clouds and wind during the afternoon and evening. The total rainfall predicted by the model through midnight tonight is shown below. The model says close, but no rain here at the house, or at the airport. There were several strong thunderstorms yesterday along the border lands from around Ft. Huachua to northwest of Nogales. The Sasabe RAWS station had 0.08" of rain but with a thunderstorm gust of 59 mph (51 kt); Ft. Huachuca reported thunder with 48 mph and a trace of rain. The ALERT gauge near Arivaca (Las Guijas Mountain) was the only station in the network to measure rain, but the amount was 0.67". In the Tucson metro are during the afternoon and evening there was a mixture of thunderstorm anvil cloud cover with some middle clouds, especially at sunset. The IR satellite images (above 02 UTC and below 05 UTC) show thunderstorms anvils along the borderlands, with a small MCS at 05 UTC, mostly south of the border (Nogales did report thunder and 0.04" during the afternoon). My feel is that the Friday (day 2) WRF-GFS forecast for southeastern Arizona was better than yesterday morning's day 1 forecast. 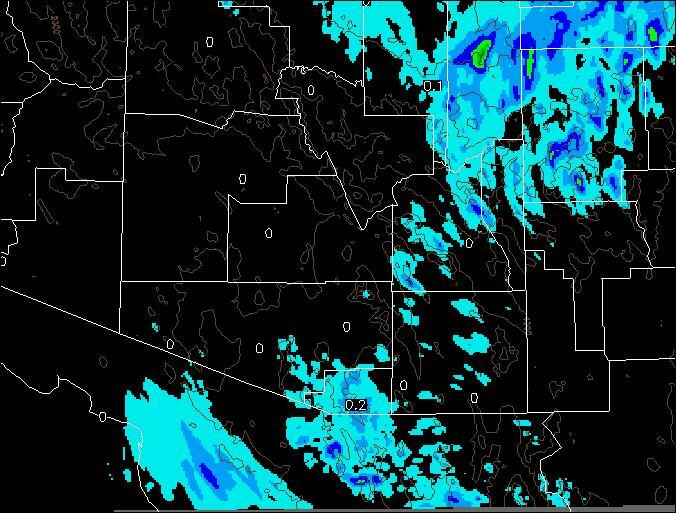 Weak outflows moved into southeastern Arizona during the night, increasing PW values to around 30 mm by sunrise. The GPS - RAOB comparison for U of A (below) shows the gradual increase during the past 5 days - from less than 5 mm on the 20th to 30 mm this morning. A gradual increase in PW, rather than an impulsive surge. More later on the model forecasts this morning. Tropical Storm Debby - the NHC has named the system in the Gulf of Mexico as a new tropical storm. Their first forecast for TS Debby (above) has gone with the models having a track to the west. Debby is a very strange looking tropical storm (2230 UTC visible image below). The low pressure circulation is located west of the large area of convection and cloudiness that stretches from western Cuba north to the Florida Panhandle.Satellite loops indicate little or no deep convection within the low's circulation. It will be interesting to watch how this system evolves during the next several days. 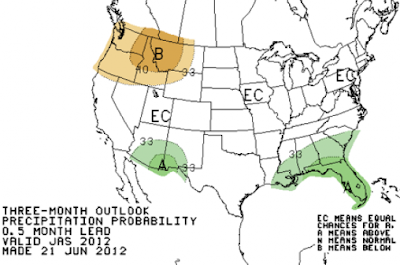 Climate Prediction Center - the CPC has issued a new precipitation outlook for JAS - above. 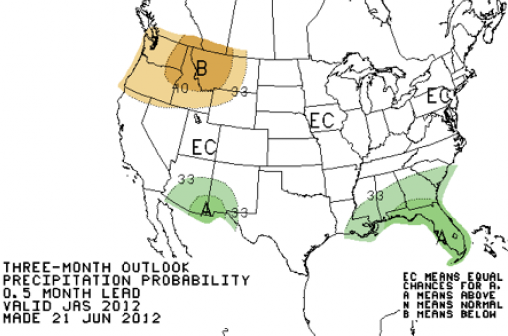 Their outlook now has a wet area for the Southwest. Thus, CPC's outlook now has similarities to Art Douglas' outlook below, which was posted here on Thursday. My fingers are crossed in hopes that they'll both be right. Yesterday's early run of the Atmo WRF-GFS forecast increased storms and PW today with some activity in Pima County. The forecast from today's early run is not nearly so active. The 4 pm forecast of PW for today (above) shows values remaining near 20 mm over eastern Pima County, with a plume of slightly higher amounts out to the west. The forecast sounding for TUS at 4 pm today is shown below. While there is a favorable wind profile (east-southeasterly mid-level winds veering to southwesterly at upper-levels), there is no CAPE available for convection - at least at low elevations. The model forecast only gets storms going over in the White Mountains and briefly along the borderlands. So today's model run indicates a fairly typical, hot late June day. In fact, the model does not forecast much storm activity over southeastern Arizona for the next three days. The above graphic shows total accumulated precipitation forecast by WRF-GFS through 9 pm next Monday evening - pretty dismal. Our main hope for significant, low-level moisture influx will likely depend on how MCS activity evolves in Sonora the next two evenings - we need a significant thunderstorm complex closer to the border, with outflows making it north across Pima County. Finally, the 700 mb analysis for 12 UTC this morning (below - from NCAR RAL) depicts both the large anticyclone covering the southern US, as well as a very large tropical low over the Gulf of Mexico. The long term models have different forecasts for how the GoM system will evolve. Both the GFS and ECMWF forecast intensification, with the GFS seeming to intensify the system to hurricane strength (at least some of the ensemble members). The ECMWF seems to indicate that it will become a westward-moving tropical storm. The GFS ensemble members are about split on whether this system will eventually head northeast or westward. If the system moves across northern Mexico, it could have a significant influence on the Southwest as July begins. Plenty of interesting features to follow during coming days. Yesterday afternoon isolated thunderstorms occurred about as forecast by Atmo's early run of the WRF-GFS. The storms were generally to the east, over higher terrain, and also in Santa Cruz County. 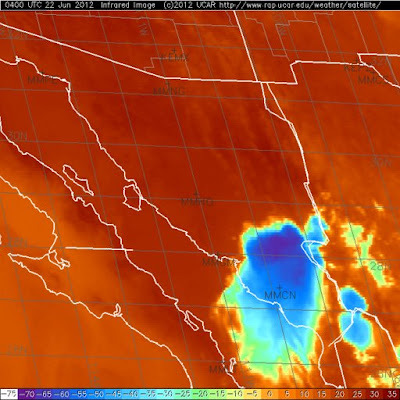 The IR satellite image above, with lightning strikes superposed, was sent along by Art Douglas - time of image was 0245 UTC. There are some CGs indicated near Nogales. The bulk of the lightning was associated with the substantial MCS over Sonora - Carlos Minjarez reported storms, hail, wind and 14 mm of rain at his location in Hermosilla. The plot of GPS and RAOB PW at Tucson (below) shows that PW has been slowly increasing during the past 5 days - values now being around 20 mm. The agreement between the systems has, frankly, been remarkable given the dry heat of the the past 5 days - high yesterday at TUS was 108F. The big question is whether the increase will continue and lead to some storms of more substance on this side of the border. Because of low-level outflow from last night's northern MCS, one would expect that, if there is another this evening, that it would be further north. More on what's in store in next post. 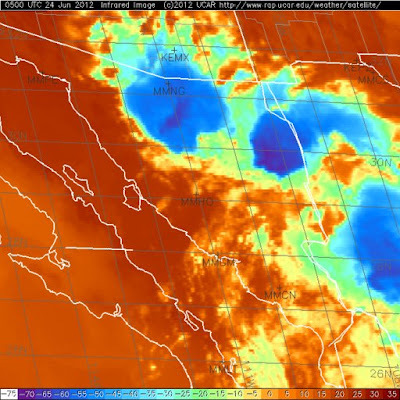 Yesterday afternoon thunderstorms stayed mostly in New Mexico (visible images above and below are from 01Z 22 June 2012) and in Mexico south of about 28 degrees N. The moist, mT low-level air along the west coast of Mexico had pushed north about half way up the Gulf of California. A complicating factor was that surface air with higher dewpoints was also pushing westward across New Mexico, behind a back-door front. There was a moderate-sized MCS over southern Sonora at 04Z - see color IR image 2nd below. The weather story yesterday for southeastern Arizona was blistering heat and slowly increasing surface dewpoints. The full product suite from the Atmo early run of its high-resolution WRF-GFS model is available this morning, and I will mostly discuss the model forecasts. However, we do start the day off with quite warm temperatures in the middle levels of troposphere, although the forecasts indicate a couple of degrees of cooling during the next 48-hours. The WRF forecasts for this afternoon and evening indicate moderate moisture convergence east of Tucson where upsloe flow from the low desert converges with weakening easterly flow behind the decaying, back-door front. The model forecasts high-based storms mostly over higher elevations to the east and the south, with evening storms in Santa Cruz County. Precipitation amounts are very light. Outflows are strong but not long-lived, nor do they seem to grow upscale into organized mesoscale boundaries. 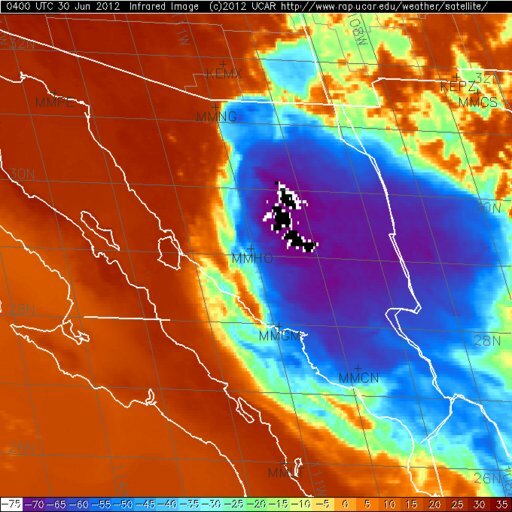 Tomorrow (Saturday June 23rd) becomes more interesting as significant amounts of PW are forecast into southern Arizona from the GoC. 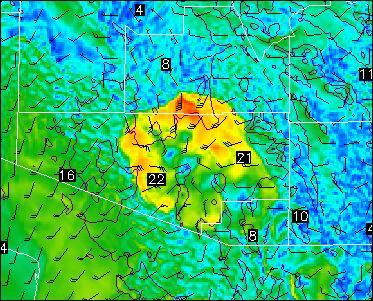 The graphic below shows PW at 7 pm MST tomorrow evening - note that values climb above 40 mm in central Pima County. The forecast composite radar image at 7 pm (above) indicates storms in Santa Cruz and eastern Pima County. The model forecast CAPE remains in the 500 to 1000 J/kg range (with the model values typically a bit too optimistic), thus the reason for the spotty character of the storms. The storms tomorrow also tend to keep to the higher elevations. Rain amounts are quite light. However, the model does forecast a strong, mesoscale outflow to move westward across Pima County. The system in northern Sonora moves toward the border and eventually sends an outflow northward across the Tucson metro during the late night and early morning hours of Sunday. Appears to be an interesting start to the summer thunderstorm season here in southeast Arizona. The weather on Sunday will of course depend strongly on what actually transpires during the next 48-hours. There is a disturbance south of the Gulf of California (just at southern edge of this morning's NAM 700 mb analysis - above) that appears to moving north-northwestward at current time. In fact satellite loops indicate that it is actually positioned a bit north of where the NAM analysis indicates. Most important question is: How strong a surge of low-level moisture will this circulation be able to trigger? Note that this feature may have its roots linked to what was once Hurricane Carlotta. Current NESDIS blended TPW product (above) indicates an advance of higher values already occurring up the Gulf of California (GoC), with values of 30+ mm indicated about half way up GoC. The NAM 72-hour 850 mb and PW forecast is shown above - valid at 5 am MST on Sunday morning the 24th. Forecast indicates a significant surge of GoC and an mT intrusion into southern Arizona. Very interesting situation. Typically a GoC surge evolves much faster than the NAM and GFS forecasts, so tomorrow morning could see the arrival of substantially higher dewpoints. Mike Luethold tells me that the WRF-GFS runs this morning forecast storms in southeastern Arizona tomorrow - display problems have kept me from viewing the models forecast products past 9 pm this evening. Art has shared some of his analog outlooks for this summer - they are shown above for the Southwest, by month and for entire summer. All I can say that there is a tremendous difference between Art's outlook and the useless, non-forecast from NOAA-CPC of equal chances for anything. I certainly hope that Art's outlook verifies well - it would be some good relief from our months of hot and dry so far in 2012. Thanks so much for sharing these Art! 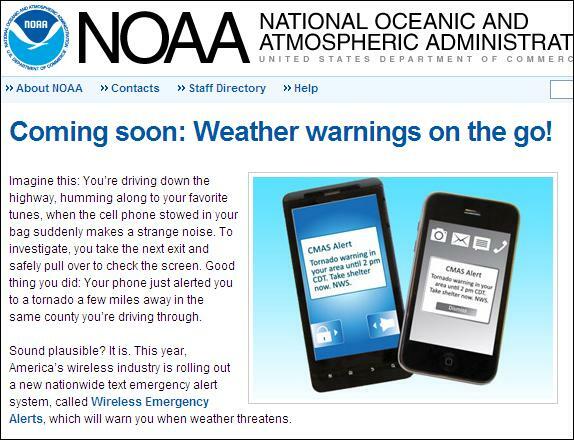 Put an application on your cell phone and receive NWS storm warnings in real-time, wherever you are! Just imagine all the phones ringing with a 30 county warning as per below. "...you take the next exit..." Oh sure, more like you run off the road trying to get your phone out. Thursday Night: A slight chance of showers and thunderstorms before 2am, then a slight chance of showers and thunderstorms after 3am. Partly cloudy, with a low around 64. Light west wind. Chance of precipitation is 20%. From my email this morning - someone alerted me to the amazingly precise forecast (above) made by an NWS Office. The forecast was issued yesterday (Tuesday) and is valid tomorrow night (Thursday). This is grid-point forecasting right out of "The Twilight Zone." The 2345 UTC surface plot above shows very hot and dry conditions over much of the Southwest this afternoon - triple digit temperatures and single digit dewpoints at many locations. The RH at the airport is currently 3%. With gusty, desiccating winds it is ugly out there - it's like a desert. Below is the blended, total precipitable water product from CIRA at CSU. High precipitable water (30 to 50 mm) has intruded into the southern third of the Gulf of California. It will be interesting to follow it's progression northward next few days. The NWS forecasts 20 to 40% POPS for the airport (TUS) next Saturday through Tuesday. This seems to me a very gutsy forecast, but I'd certainly love to get some real rain in the gauge. 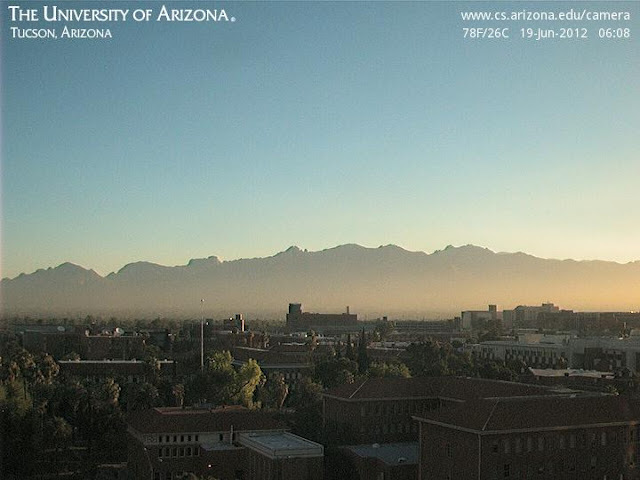 First, it's another morning with considerable smoke over the Tucson metro area, as per image (above) from Computer Sciences building this morning. Was a very strange looking sunrise. The source of the smoke is not clear, since there are so many wildfires burning in the Southwest. Several wildfires are burning in the Arizona Rim Country, and there is a smoke plume visible this morning on satellite images from the fire near Payson. Will be a tough day for firefighters as a short-wave trough at 500 mb moves through the northern Rockies, increasing the winds again today over most of the Southwest. The 12 UTC plot of 500 mb observations (shown above) indicates several things of note. First, as we are now in the time of year when upper-air data from Mexico can be very important, it appears that we may again have few soundings available - note above that there were only three morning soundings from Mexico in the plot from NCAR. However, I checked the Wyoming upper-air site and find that the only key site missing this morning is Guaymas - as per last year at this time. Thus, a data ingest problem at NCAR continues into this summer - users be aware and cross-check at Wyoming. 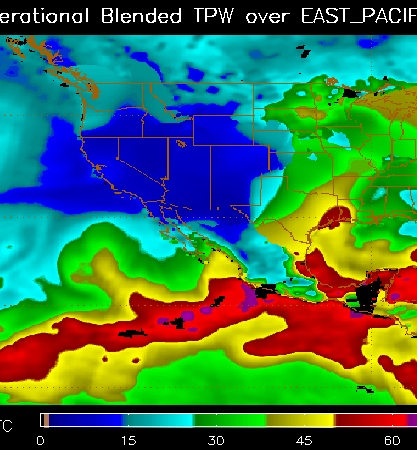 Very warm air from over the Pacific covers much of the Southwest, with temperatures of -1 to -4C common. Temperatures at 700 mb over the Southwest range from13 to 17C. The NAM 00-hour analysis of the 500 mb level is shown below. the model analyzes two distinct anticyclones over the US - one centered over the Ohio River Valley and the other over northern Baja. These will be consolidating during the week into a large, summertime anticyclone covering much of central and southern US. Final note (ref to post below) - I checked back on what brought the first influx of high dewpoint air into Arizona last summer. It was a push up the Gulf of California, stimulated by Tropical Storm Beatriz, which formed just off Cabo Corrientes (see current NHC outlook - bottom graphic), where there may be development in the next few days..
Slightly Better Than A Tease! Strong Outflow And Dust This Afternoon?